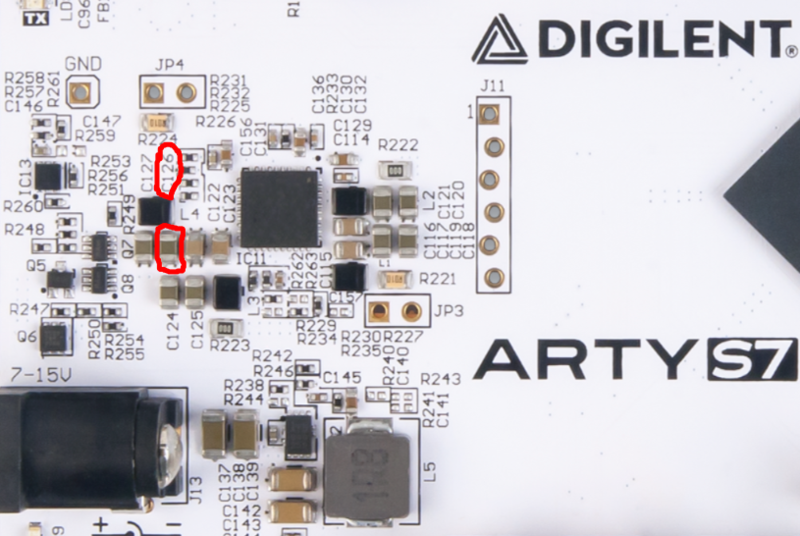 I have been working on developing an I2c interface on the arty s7 board, and during one of my hardware tests, I noticed that my debug LED's had shut off. I went to resend my bit stream and noticed that my hardware manager was no longer connected to the device. Whenever I plug the device in, it is clear that I am getting power, as the done LED, the power LED, and the TX LED are all on. However, when I attempt to reset the device using either the reset or program button, no change occurs (that is, the strobing LED pattern does not commence as it has in the past). I have checked my device manager and found that the s7 is no longer connected, and have restarted my computer as well as unplugged and replugged the s7. My primary concern is that this may be a hardware issue, but I am unsure as to what I could have done to cause this. I have been running 3 3.3v pins from the arty to a teensy. Any advice would be helpful. Have you tried using different usb cables and a different usb port? Thank you for the response, I have switched USB cables and ports. I have also noticed that the IC's and caps near JP3 and JP4 are getting quite hot, and the tx LED has now shut off. I am unsure if the temperature is within reason, but it is certainly hotter than I would have expected. Upon inspection, I have not seen any visible shorts, but something of that nature feels likely to me. I sent you a PM out this. Let us know if this does not fix the issue. Since the process in the PM did not work it looks like the issue is hardware related. The caps you describe that are getting hot are part of the power regulation circuit. Can you take voltage measurements with a DMM on the following capacitors: C138, C144, C116, C118, C120, C124 and C126. Are you powering the Arty S7 externally or through the usb cable. Are you using a powered usb hub? Its looking like its an issue with the power regulator. Could you re-measure C126, and measure C115. I have attached a picture of the Arty-S7 the shows where C126 is on the board. Is this the capacitor you have been measuring? Yes, that is the cap I have been measuring. It appears that the power regulator is damaged. Specifically the 1.8v rail. I have PM'd you about the next step.